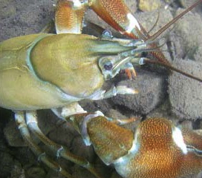 Invasive crayfish from the east have been spotted for the 1st time west of the Rockies, in a river in Eastern Oregon and a stream in Corvallis. They were shipped to elementary schools for biology classes and then released where they don’t belong by well meaning children or their teachers. The upgrades include invasive species lessons for the FOSS Structures of Life kit. This perspective from Louisiana on Sea Grant’s research on invasive species in the classroom make a good news article for teachers to share with their classes. "You're welcome to spread the cartoon as an invasive species, as needed. With my compliments."